Participants from the last Master Class in Agricultural Research Leadership and Management in Penang, Malaysia. 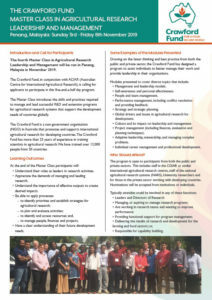 The fourth Master Class in Agricultural Research Leadership and Management, delivered by The Crawford Fund, in conjunction with ACIAR will be held in Penang, Malaysia from 3-8 November 2019. Applications for this highly regarded 5-day training opportunity are now open. The size of the Master Class is strictly limited. The Crawford Fund has more than 25 years of experience in training scientists in agricultural research. We have proudly trained over 12,000 people from 50 countries. The Master Class introduces the skills and practices required to manage and lead successful R&D and extension programs for agricultural research systems that support the development needs of countries globally. The program is open to participants from both the public and private sectors. This includes staff in CGIAR or similar international agricultural research centres, staff of the national agricultural research systems (NARS), University researchers and for those in the private sector working with developing countries. Nominations will be accepted from institutions or individuals. The Master Class is delivered from a hands-on perspective by experienced and successful practitioners. It will be led by Shaun Coffey, and assisted by Lynne O’Brien and Colin Chartres. Please register your interest by 30 June 2019. More information is available here.